Those of you who make it out to the Monday night shows of Theater Pub have probably met, and grown to love May, the proprietor of Big May’s Hide Away Blues BBQ, the people who bring us lobster mac and cheese, giant plates of peach cobbler, and booze soaked cupcakes. Honestly, we can’t say enough about this amazing woman, and then just when it can’t get better, she themes her menu to our show and shows up to the opening night of LOVE IN A TIME OF ZOMBIES wearing a wig and scary eye make-up. You can’t scare us, May. You can only make us love you in a new way. Is there anything better than being greeted with enthusiasm, delicious lobster mac n’cheese and the booziest pulled pork sandwich in the world? It’s sprayed with bourbon. SPRAYED WITH BOURBON. 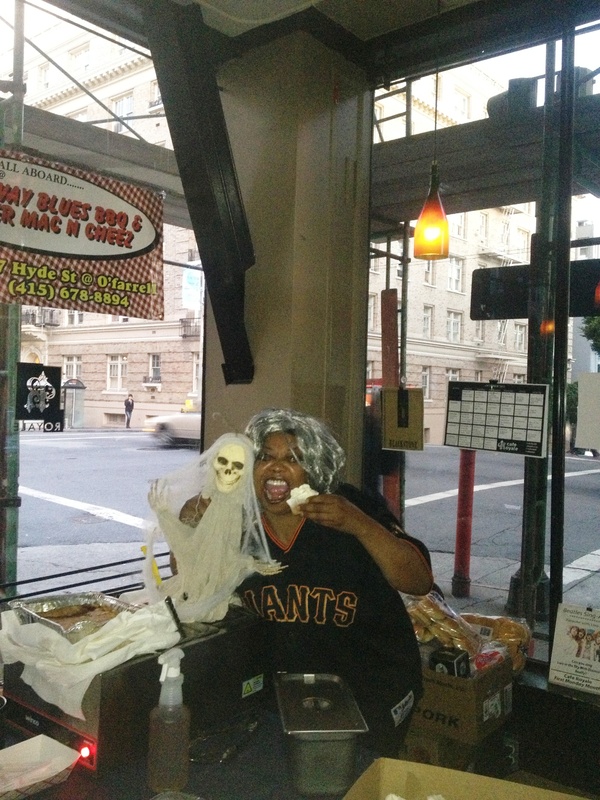 On non-Theater Pub nights, you can find May at Hide Away Blues BBQ at 457 Hyde Street, but it’s a science fact that the unbeatable combination is BBQ + beer + Theater, so make sure you help us keep her at Theater Pub by coming hungry whenever you come on Monday nights. And if you come on Tuesdays, don’t despair: there’s a pop-up sushi restaurant to complete your evening! Be sure to come see LOVE IN A TIME OF ZOMBIES, with four more performances this month- tonight, Monday the 22nd, and Monday and Tuesday the 29th and 30th of October!